This month's author under the spotlight is fellow Spotlighter at "Bloody Scotland" - Tom Keenan. Thank you so much for letting me grill you, Tom! Your first novel, "The Father" features a detective and a forensic profiler. Tell me more about them? "The Father" features Jackie Kaminski, a detective inspector, and Sean Rooney, a forensic psychologist, erstwhile partners in love, but now partners in crime. Sean has retired. Too many murders, too many psychopaths, too many failures, had taken its toll. Jackie, however, tempts him out of his retirement with the one he has always wanted, a proxy killer. Can he do it, can he cope with this one? "The Father" is the first in a three-book series. Did you always intend to write a series? How many in the series are currently planned out? I was encouraged to write a three book Sean Rooney series by my publisher who believed there was more to come from him and this pair, and he was right - book two is with him to be published. Draft one of book three is pouring out of my mind into my computer. What will you be working on once the series is complete? I have another couple of books under way, but at an early stage. They will be very different in genre and content. I also fancy writing a children’s book, which hopefully will please my grandchildren; or historical crime fiction, which won’t. You’re an independent social worker in the area of mental health and are a Safeguarder in Glasgow Sherriff Court. What does a Safeguarder do? A Safeguarder protects the interests of vulnerable and incapable adults where legal proceedings in the sheriff court are being taken to transfer their decision making to another person or the local authority. My role as a social worker is much broader, providing reports for solicitor agencies supporting and defending clients also involved in legal proceedings. That’s a big change from writing! When did you first start writing novels? And what made you start? I started writing novels about ten years ago after completing a legal book across mental health legislations in Scotland. I had always written stories, however, and poems, songs, and plays after doing a playwriting course with 7:84 theatre company. 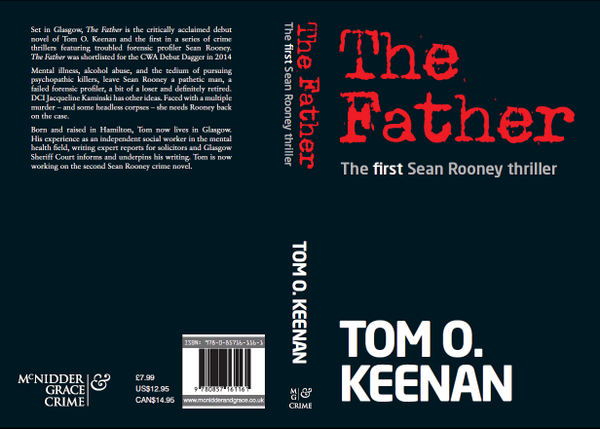 "The Father" was my first full-length novel, although I had written a couple of books in its various incarnations, self-publishing under other titles. It really helped to see my work in a physical self-published form, then to polish it and get it right. No regrets, although to be a full time writer is my goal. I still need a ‘day job’ to keep the wolves from the door. I just loved wandering around, taking in the event and the amazing atmosphere, seeing all of those famous authors face to face. However, appearing before Nicci French, husband-and-wife team Nicci Gerrard and Sean French, who also write psychological thrillers, and to over one hundred people, was the highlight for me, and to hear about their particular writing technique. I moved home about a year ago, opening a B and B in a farmhouse in the highlands of Scotland, so I lost my garret (in my attic) which had been my writing space for a few years. Now I write in a room which was used as an abattoir for the farm, I suppose an appropriate place to write about the dark world of murder and mayhem. Radio Scotland for current affairs and Scottish culture and Radio 4 for the drama and any book stuff. A limitless supply of paper and pens. Then I can write without the distraction of having access to the internet and I can use the countless scrunched up papers used in editing as loo paper (sorry toilet humour!). Green, to reflect my Irish genetics. James Bond every time, but only with Sean Connery! Border collies any day of the week! Country, since I moved to the Highlands. City, when I lived in Glasgow. I am a city boy who loves the country! Real book every time, although I must confess to downloading lots of e-books (for reference purposes only you’ll understand!). Fountain pen is my preference, but I rely on biros for everyday use. Thank you so much to Tom for letting me grill him! 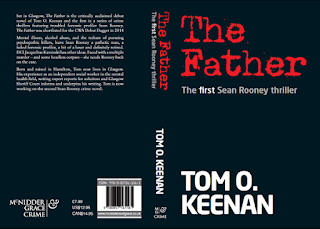 Tom's book The Father is available now.